The train pulls into the station, the doors open and you make a beeline for the escalators. You stick to the left and walk up the stairs, figuring you can save precious seconds and get a bit of exercise. But you’re doing it wrong, seizing an advantage at the expense of other commuters. Boarding an escalator 2-by-2 and standing side by side is the better approach, says The New York Times (April 5, 2017) and it is more efficient if nobody walks on the escalator. The question of standing versus walking flared up recently in Washington, D.C. after the Metro said the practice of walking on the left could damage the escalator. The escalator company Otis said this is not true, but passengers should not walk on escalators, as a matter of safety. The Metro is not the first mass transit operator to try to address this issue. Last year, the London Underground tried to change passengers’ behaviors and get them to stand side-by-side riding — not walking. The Underground had concluded that in very tall stations, much of the left side went unused, causing blockages and lines at the bottom. It campaigned to fill the available space on the escalators with people, rather than leaving the left side of each step largely empty, except for those who chose to hike up. 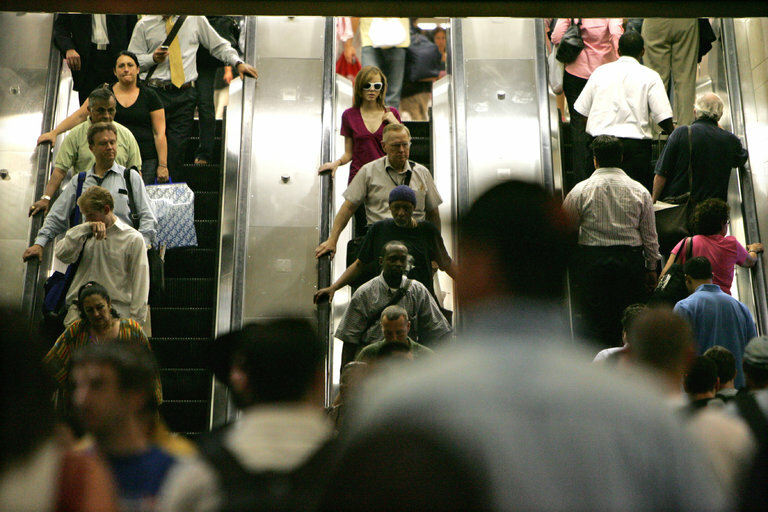 It found that standing on both sides of an escalator reduced congestion by about 30%. Walking up the escalator took 26 seconds compared with standing, which took 40 seconds. However, the “time in system” — or how long it took to stand in line to reach an escalator then ride it — dropped sharply when everyone stood. When 40% of the people walked, the average time for standers was 138 seconds and 46 seconds for walkers. When everyone stood, the average time fell to 59 seconds. For walkers, that meant losing 13 seconds but for standers, it was a 79-second improvement. The length of the line to reach and step onto an escalator dropped to 24 people from 73. Will this happen in the U.S? Explain the concept of “time in system”?